The military says soldiers opened fire only when necessary against those throwing stones and firebombs or rolling tyres at soldiers. 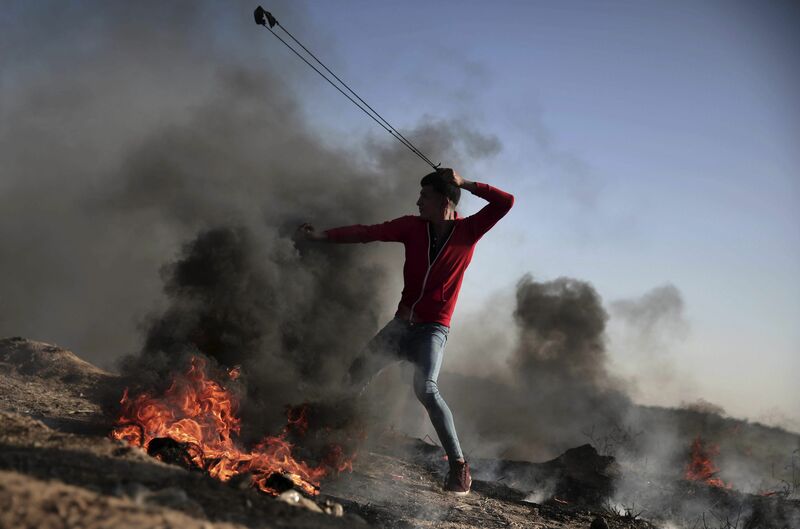 GAZA CITY: Protests along the Gaza border with Israel have dwindled after the conflict's deadliest day in years, but both sides braced for further tensions Monday after Palestinians called for more demonstrations. The death toll from Friday's violence along the border between the Gaza Strip and Israel rose by one to 17 on Monday when the health ministry in the enclave confirmed another Palestinian had died from his wounds. The Islamic Jihad militant group said in a statement that Faris al-Raqib, 29, was a member, but that he was not carrying a weapon when he was shot. In an AFP photo before his injury, Raqib is seen carrying one of the wounded away from the clashes. Hundreds of other Palestinians were wounded on Friday, many of them by gun fire, when a mass protest of tens of thousands led to clashes with Israeli forces along the Gaza border. The toll prompted the European Union and UN Secretary-General Antonio Guterres to call for an independent investigation, which Israel has flatly rejected. Demonstrations along the border since Friday have included only several hundred people, but large crowds may return in the coming days, including after the weekly Muslim prayer on Friday. Hamas, the Islamist movement that runs the Gaza Strip and which has fought three wars with Israel since 2008, has called for more mass demonstrations. The protests are in support of Palestinian refugees returning to lands they fled or were expelled from during the 1948 war surrounding Israel's creation. "The Palestinian people are determined to continue the great 'March of Return,' to free the land and move towards occupied Jerusalem, and they are not concerned by all the sacrifices," senior Hamas member Khalil al-Hayya told a memorial ceremony, while also vowing that the Islamist group would not disarm. The border area was relatively quiet on Monday morning, but tents erected for the protests remained. Near the Erez crossing into Israel, a few dozen young men sat around while others erected new tents. 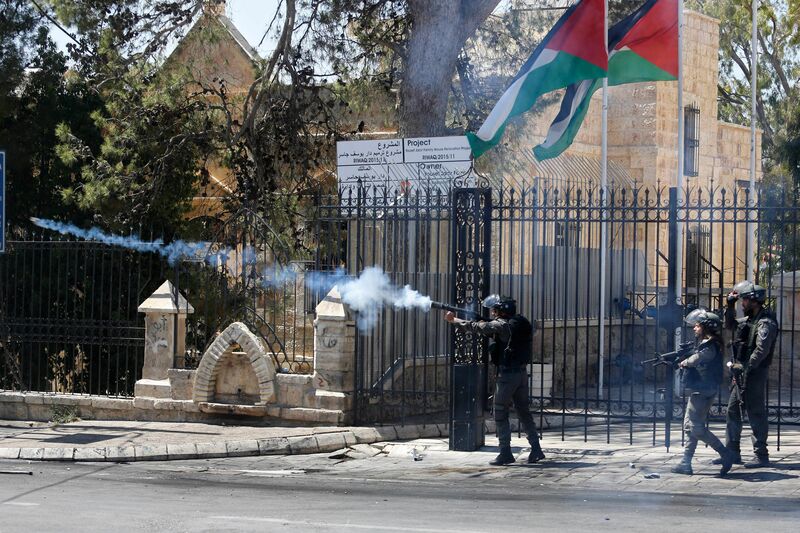 Israel has defended its soldiers' actions, when they opened fire Friday on Palestinians who strayed from a main protest camp and approached the heavily fortified fence cutting off the blockaded enclave. Israel accuses Hamas of using the protest as cover to carry out violence. 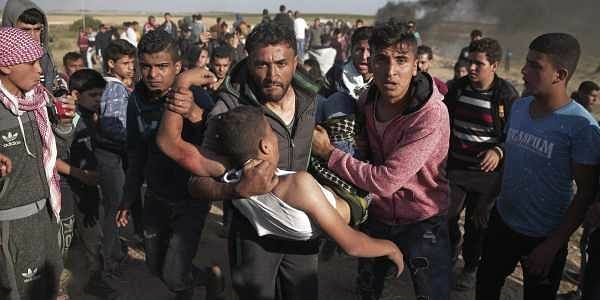 In addition to the 17 Palestinians killed, more than 1,400 were wounded Friday, 757 of them by live fire, with the remainder hurt by rubber bullets and tear gas inhalation, the health ministry in Gaza said. The armed wing of Hamas said five of those killed were its members who were participating "in popular events side-by-side with their people". The Israeli army alleges 10 of the dead had "documented terror backgrounds" in Hamas and other groups and were killed "whilst carrying out acts of terror". Israel's army has issued a statement saying footage is being "edited and fabricated," without referring to specific videos. The Gaza protests are designed to last six weeks, ending around the time the United States moves its embassy from Tel Aviv to Jerusalem in mid-May. The embassy move has deeply angered the Palestinians, who see Jerusalem's annexed eastern sector as the capital of their future state. May 14 will also mark 70 years since the creation of Israel and is when the United States is expected to open its new Jerusalem embassy. Palestinians will mark what they call the Nakba, or "catastrophe," the following day. The Nakba commemorates the more than 700,000 Palestinians who either fled or were expelled from their homes in the war surrounding Israel's creation in 1948. The holy Muslim fasting month of Ramadan is also due to begin in mid-May.